Johanna J. Smith, MA, LPC, combines her passionate love of children, horses, and history in Star Gazer, The Horse Who Loved History. Ms. Smith's love of horses dates back to her childhood experiences as an accomplished equestrian in Southern Pines, North Carolina. After graduating from Appalachian State University with a BS in English, Ms. Smith earned a master's degree in psychology from the University of West Georgia. She then moved to Sierra Leone, West Africa, where she taught tribal children in the town of Koribundo. Her time in Sierra Leone allowed Ms. Smith to observe firsthand how absolute poverty and lack of education fosters conflict between nations. Ms. Smith also lived in Rabat, Morocco, where she taught English as a second language. Ms. Smith maintains a private psychotherapy practice for children and adults close to Philadelphia, Pennsylvania. Johanna J. Smith, MA, LPC grew up in Southern Pines, North Carolina, a well-known horse oasis for show jumping. While living there, she competed in numerous equestrian events riding for the Master of Hounds. This lifelong love of horses led her to create her first children’s book, Star Gazer, The Horse Who Loved History. After graduating from Appalachian State University with a BS in English, she completed a Master’s degree from the University of West Georgia. Seeking adventure combined with an enduring interest in working for world peace, she joined the Peace Corps and lived for approximately two years in Sierra Leone, West Africa. Sierra Leone was an ex-British colony with English as the national language. However, because there are 17 different tribes in Sierra Leone each speaking different languages, it was thought that learning a common English language, would help unify the country. While working and living in Sierra Leone, Ms. Smith was exposed to tropical diseases, tropical snakes, and the constant fear of tribal warfare. Fortunately, Ms. Smith was no longer living in Sierra Leone when a civil war broke out that raged for 10 years resulting in the brutal killings of thousands of innocent men, women, and children. Whichever tribe ruled the country would also control the lucrative diamond fields, thus resulting in one of the most humanitarian atrocities in the nation’s history. This civil war also later resulted in filming the popular movie Blood Diamond. After leaving Sierra Leone, Ms. Smith continued to seek adventure when she moved to Rabat, Morocco. There she worked for the American Embassy also teaching English as a Second Language to Moroccans. Ms. Smith was always treated with the deepest respect, and experienced the friendly hospitality of this Islamic culture. Often times her students invited her to their homes to meet their families and to share dinner. 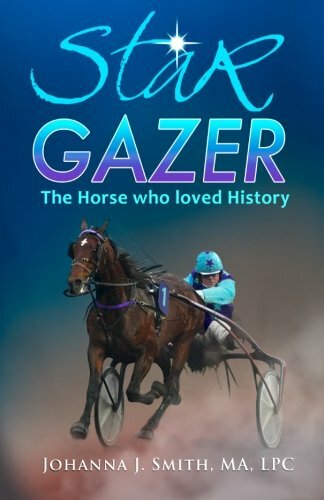 These experiences of cultures that she didn’t understand and the potential for conflicts inspired her with the ideas that formed the basis of Star Gazer, The Horse Who Loved History. The possibility of world peace will come from the world’s children who are tired of bombing, their homes being demolished, and being forced to become refugees. Following her adventures teaching abroad, Ms. Smith became a psychotherapist. She has dedicated more than 35 years to counseling children and families through her private practice, based in Philadelphia. Her insights into children and their behavior help inspire and inform her approach to writing children's books. Philadelphia, her adopted home and the birthplace of American democracy, provides the backdrop for Star Gazer, The Horse Who Loved History. Star Gazer, The Horse Who Loved History will be a series with Star Gazer visiting different countries around the world learning the history of other countries, and telling children that the United States desires friendship with all nations. While working in Rabat, Morocco, Ms. Smith traveled to Marrakesh, a beautiful pink city located in the southern region of Morocco. There were numerous domesticated camels outside the walls of the city, and tourists would pose and have their pictures taken while sitting on one of these enormous animals. Not simply wanting the tourist experience, Ms. Smith took a rickety but ultimately rewarding bus trip that traveled to one of the most remote villages in the Sahara. While wandering around this dusty village, Abdul, an Arab approached her to ask what she wanted. Ms. Smith informed him she wanted to ride a camel in the desert. Abdul stated his family owned many camels, and he would take her the next morning to ride one. Early the next morning Abdul and Ms. Smith hiked into the Sahara. A hot wind blew, and numerous pesky flies attacked her face and eyes. Draping a chartreuse sweater across her face for protection against these biting insects, they continued their sweltering journey under the relentless heat. After hiking for over an hour, the tiny village where Ms. Smith had spent the night had long since disappeared in the distance. Only the shimmering desert could be seen out to the horizon in every direction. “Where are your camels?” she asked Abdul. “Out there,” he replied. As time passed and they continued traveling, with no camels in sight, again Ms. Smith asked, “Where are your camels?” Abdul gestured toward the Sahara, and again said, “Out there.” Ms. Smith thought they would soon see a camel ranch, where camels would be in corrals, and a ranch house where they could sit, drink coffee, and eat breakfast before saddling up the camels for a ride into the desert. Now she understood. There wasn’t a camel ranch, they really did have to find Abdul’s camels somewhere out in the desert. Still determined to ride a camel in the desert, she trudged on believing Abdul would soon find one of these elusive dromedaries. Suddenly a small herd of camels could be seen far off in the distance. Elated, Ms. Smith began running toward them yelling, “Camels, camels.” Abdul immediately stopped her. “Those camels don’t belong to my family, you can’t ride them.” Shocked Ms. Smith replied, “Who do those camels belong to?” Abdul replied in a matter of fact tone of voice, “Those camels belong to the army.” Frustrated Ms. Smith stated, “You can look in every direction, and there aren’t any people around. Let me ride one of these camels.” Abdul refused, but just kept walking in the desert. Dusk followed the setting sun when Abdul pointed to a distant herd of camels. “Those camels belong to my family.” The camels recognized their owner and did not run when Abdul approached. He threw a rope around the neck of a muscular one humped dromedary, commanding the camel in Arabic. The animal groaned but knowing what was expected of him next, he lowered his body to the ground expecting a rider to mount. Ms. Smith excitedly jumped on the back of this camel, and invited Abdul to ride along with her. “No,” he replied, “I will walk.” Night soon covered them as they began her enthusiastic camel ride. Without city lights, the stars and the moon lit their walk in the Sahara. Faintly on their night time journey, thundering hooves could be heard approaching in the distance. A herd of camels suddenly galloped past them as if on a desperate mission. Free from the heat of the day, Abdul informed Ms. Smith that all the creatures inhabiting the unforgiving desert would come out for water and food in the cool of the evening. Ms. Smith rocked along in rhythm with her troding camel, and continued to enjoy her high seated night time excursion. She was taken with emotion as she thought of the many notable people that had ridden across these same deserts centuries earlier in the same manner that she was now experiencing. The energy that flowed up from the waves of sand had witnessed Abraham, Sarah, Jesus, and Ishmael. All witnessed the commonality of people whose lives had changed the course of the world. As the sun rose, the apparitions that had been her companions during the night disappeared.